NCERT Textbook Solutions are considered extremely helpful when preparing for your CBSE Class 8 Science exams. TopperLearning study resources infuse profound knowledge, and our Textbook Solutions compiled by our subject experts are no different. Here you will find all the answers to the NCERT textbook questions of Chapter 16 - Light. All our solutions for Chapter 16 - Light are prepared considering the latest CBSE syllabus, and they are amended from time to time. Our free NCERT Textbook Solutions for CBSE Class 8 Science will strengthen your fundamentals in this chapter and can help you to score more marks in the examination. Refer to our Textbook Solutions any time, while doing your homework or while preparing for the exam. We can see objects only if light from any source enters our eyes. If we are in a dark room, then it is not possible for us to see objects in the room. However, if there is light outside the room, then objects outside the room are visible to us. Concept insight: Light enables us to see things from which it comes or from which it is reflected. Regular reflection takes place from a smooth or a regular surface. In regular reflection, all reflected rays are parallel to each other for parallel incident rays. Irregular or diffused reflection takes place from a rough or an irregular surface. In diffused reflection, the reflected rays are not parallel to each other for parallel incident rays. This happens because of the presence of microscopic irregularities of the surface on which light rays are incident. Hence, parallel incident rays reflect in different directions. However, each ray obeys the laws of reflection. Therefore, laws of reflections are not violated in diffused or irregular reflection. Concept insight: A polished surface is an example of a smooth surface. A polished wooden table has a smooth surface. Hence, reflections from the polished table will be regular. Concept insight: Chalk power spread on a surface is an example of an irregular surface. It is not smooth. Therefore, diffused reflection will take place from chalk powder. Concept insight: Cardboard surface is also an example of an irregular surface. Hence, diffused reflection will take place from a cardboard surface. Concept insight: Marble floor with water spread over it is an example of a regular surface. This is because water makes the marble surface smooth. Hence, regular reflection will take place from this surface. Concept insight: Mirror has a smooth surface. Therefore, it will give a regular reflection. Concept insight: Although a piece of paper may look smooth, but it has many irregularities on its surface. Due to this reason, it will give a diffused reflection. (i) The angle of reflection is always equal to the angle of incidence. (ii) The incident ray, the reflected ray and the normal to the reflective surface at the point of incidence, all lie in the same plane. Fix a white sheet of stiff paper on a drawing board or a table. Let the sheet project a little beyond the edge of the table. Take a comb and close all its openings except one in the middle with the help of a black paper. Hold the comb perpendicular to the sheet of paper. Throw light from a torch through the opening of the comb from one side so that a ray of light can be seen along the paper on the other side of the comb. Place a strip of plane mirror in the path of the light ray. This ray of light striking the mirror is called the incident ray. After striking the mirror, the ray of light is reflected in another direction. This is called the reflected ray. Now, cut the projecting portion of the sheet in the middle. Look at the reflected ray. Make sure that the reflected ray extends to the projected portion of the paper. Bend that part of the projected portion on which the reflected ray falls. The reflected ray that fell along this part can no longer be seen. 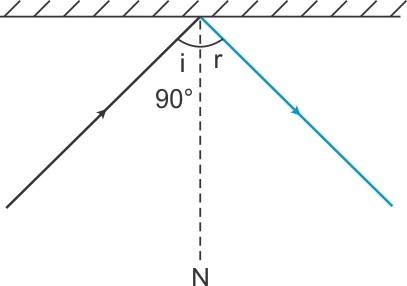 This shows that the incident ray, the reflected ray and the normal at the point of incidence lie in the same plane. Concept insight: Distance between object and mirror is equal to the distance between mirror and image. Concept insight: Image formed by a plane mirror is laterally inverted. 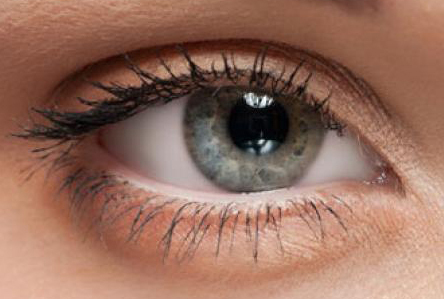 Concept insight: Size of pupil increases in dim light so that more amount of light can enter in the eye. Concept insight: Rods are sensitive to dim light. Concept Insight: The angle of incidence is always equal to the angle of reflection. This is the first law of reflection. (b) Image formed by a plane mirror is virtual, behind the mirror and of the same size as the object. 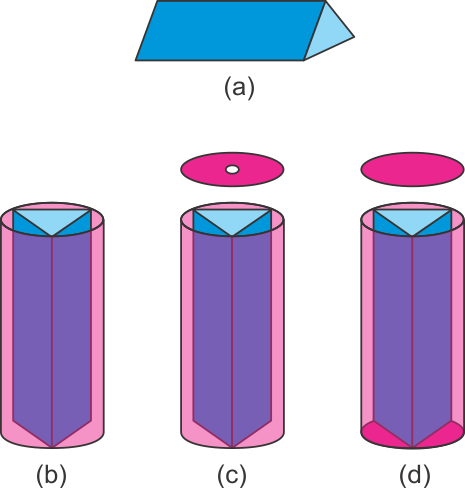 Three rectangular mirror strips of dimensions 15 cm 4 cm (l×b) are joined together to form a prism (fig a). This prism is fixed into a circular cardboard tube. The circular cardboard tube should be slightly longer that the prism (fig b). This circular tube is now closed at one end with a cardboard disc. This disc has a hole in it through which we can see (fig c). At the other end of the circular tube, a plane glass plate is fixed. It is important that this glass plate touches the prism mirrors. On this glass plate, several small and broken pieces of coloured glass are placed. This end is now closed by a round glass plate allowing enough space for the coloured glass pieces to move (fig d). Laser light is harmful for the human eye, because its intensity is very high. It can cause damage to the retina and lead to blindness. Hence, it is advisable not to look at a laser beam directly. (i) We should wash our eyes at least twice a day with clean water. (ii) We should avoid reading in dim light and very bright light. (ii) We should avoid direct exposure of eyes to the sunlight. (iii) We should clean our eyes with cold water quickly if dust particles or small insects enter your eye. We should not rub the eyes. (iv) We should maintain a distance of at least 25 cm between the book and our eyes while reading. Infinite images of the candle will be formed because of multiple reflections between the two parallel mirrors. Concept Insight: When two mirrors are placed parallel to each other, then infinite number of images are formed. The laws of reflection are used to obtain the path of reflected light. It can be observed that the given ray of light will reflect from the second mirror at an angle 60o. A plane mirror forms a virtual image behind the mirror. The image is as far behind the mirror as the object is in front of it. A cannot see his image because the length of the mirror is too short on his side. However, he can see the objects placed at points P and Q, but cannot see the object placed at point R (as shown in the given figure). (a) Image of the object placed at A is formed behind the mirror. The distance of the image from the mirror is equal to the distance of A from the mirror. Image of A is shown in the given figure. (b) Yes. Paheli at B can see this image. (c) Yes. Boojho at C can see this image. (d) Image of the object at A will not move. It will remain at the same position when Paheli moves from B to C.
TopperLearning provides step-by-step solutions for each question in each chapter in the NCERT textbook. Access Chapter 16 - Light here for free.